One of the most heartbreaking and healing moments of my own divorce came the night before it was all finalized. I was explaining it all to my son, then a preschooler, sharing that the next morning, his dad and I would stand in front of a judge and agree that our marriage would be over. He told me he wished that the judge could know the story of the three of us, that she could have a fuller picture of the whole story. I explained we couldn’t do that, but we could create one ourselves. And so I pulled out a big roll of paper and the markers and we got to work on it (you can see the project here). This ritual is just one of many that helped my son and me navigate our way through a sudden separation, a long divorce and years of single parenting that followed. It is no surprise if you know me – I’ve used rituals to fuel my spirit, soothe my stress, celebrate my triumphs and learn from my trauma most of my life. I’ve shared many of those rituals as a college instructor, teaching workshops to new moms, at church retreats, and now with my divorce coaching clients. Every time, something powerful, transcending and surprising emerges. There’s a whisper of an a-ha or a flood of tears or a squeezy hug that connects the people in the room, gives us strength and binds us together. 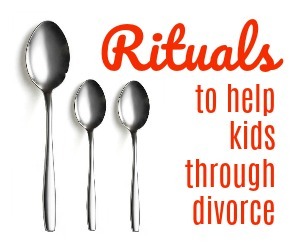 If you are standing in the gulf of divorce with children, little rituals will buoy you, too. The trick is letting go of rules or expectations, trusting your wonderful mothering instincts and holding on to each other. Here are a few rituals to get started. If your children share time with another parent, the few minutes between homes can be tough. Ease the transition by creating a simple structure that you follow every time your child comes back through your door or buckles into your car. We did 20 minutes of yoga for many months, until I recognized that my son was anxious to spend a few minutes alone playing Legos in his room. Consider playing soothing music, cooking an easy meal together, consulting the calendar to see when your child will see her other parent again. Maybe you will all feel better after some quiet time cuddling or cranking up some Beyonce on the car ride home to sing away the anxieties. It’s OK to ask your kids what would make them feel better – I imagine they will have an answer (now or after they hear you sing Halo for the eleventeenth time). You can turn that crazy-making time of collecting undies, retainers and crumpled up homework sheets into a ritual by creating an organized process. Choose a bag to designate as a special carry-over for things to take to the other parent’s home. Then create a checklist of items to include every time. Draw a picture of a toothbrush or lovey or eyeglasses for kids who are younger or need some extra care in packing a bag. Tuck in a little calendar to mark the days and activities when he’ll be gone and return, when you will be in touch and stickers or emojis to make it fun. Make an excursion out of buying a second set of socks and dental floss for the other home. Hang the bag in the same place every week. Be clear about what to do with laundry when your little one comes home. Consistency will feel good, and clear expectations will likely ease the chaos and emotions packed into those moments. When one of my clients said she’d like to get her dinner-time mojo back and stop eating in front of the television with kids, we brainstormed what she loved most about meals before divorce. She said she loved talking with her kids more than making the food, so we discussed a few easy meals she could prep and how to reconfigure the dining room so they’d face each other. Then she bought a table topics game with silly, interesting questions for kids and they made it a new ritual to ask a few each night. Another client overhauled even more, making breakfast her big, sit-down meal with her kids to combat the morning rush and resistance and to ensure than even on “daddy nights” they’d all have time together. This is your opportunity to restructure some critical time as a family. Consider the ways you can change up your meals with intention rather than slinging frozen nuggets out of survival (no judgment on frozen nuggets). There’s a grief for everyone in divorce. That doesn’t mean there can’t also be big, beautiful, happy celebrations. Acknowledge what hurts, breathe through stress, hold each other tight – and then buy a cake. Toast sparkling cider to your new life. Write your name in the cement in front of your new house. Take some time to walk through an old apartment and remember aloud the times you shared in each room. Write down each of your hopes for the day and year ahead and spend one day a month helping each other make them happen. Send off wish lanterns. Go see Hamilton. Make a locket with each parent’s picture for the kids to wear as a sign of being together no matter where your homes are now. There’s no need to force happy, just delight it in when it does show up. Many of the divorcing moms I know cringe at the thought of changing holiday traditions they’ve so lovingly nurtured. It’s hard, I do know. And it is also a chance to grow how you are celebrating together, no matter what day or time you gather and no matter who is there. We treasure Fakesgiving in our home. Ask your children how they’d plan the day and then totally shake things up this year. Volunteer at a shelter. Invite friends who can’t travel to be with family or other single moms who are solo to join you for dinner. Start something new – it may lift your spirit more than you can imagine and become a ritual you and your kids don’t ever want to change.